Naturalists studying the various types of the domestic dog during the last century became convinced that the lupoids, whose characteristics are found in the Spitz, descended from the artic wolf as did all the Nordic breeds.. 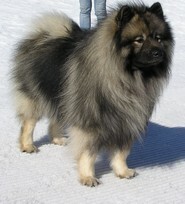 However, the fact that similarities to the present day Spitz exist in breeds originating far from arctic and subartic regions gives validity to the theory that their origins differ from that of the Nordic breeds. 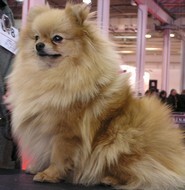 The preface of the standard of the German Spitz describes characteristics that confirms its descent from dogs found in peat areas and later from the marsh Spitz, the bones of which were studied by L. Rutimayer in DIE FAUNA DER PFAHLBAUTEN (Basle 1861). The studies of skulls found, first carried out by Rutimayer and then by others including M.Hilzheimer, have given weight to this theory. In the second half of the Stone Age there were considerable variations in the peat dogs of the time. Towards the end of the era these evolved into dogs bearing the true characteristics of the breed. Even in this period man was breeding dogs and two tendencies in the selection can be noted; the creation of ever bigger dogs on the one hand and, on the other, ever smaller breeds. So the marsh dogs, found in the settlements in Central and Southern Europe, formed groups of true breeds characterized by a common type, such as little Spitzs, traces of which have been found in vast regions of the arctic. Far away and not bordering on the extreme North. Apart from Europe, testimony to the presence of the Spitz has been found in Central, South and East Asia and as far as islands in the Pacific Ocean and Madagascar. The breed was certainly known by the ancient Egyptians. Max Siber has traced their presence also to Central Africa. 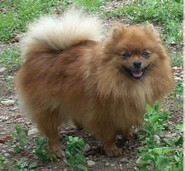 Siber also discovered a fox-like dog in Sumatra. 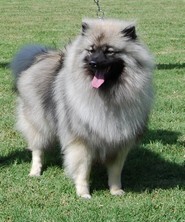 From the same branch is the Chinese Chow Chow which conserves, albeit with some variations, the marsh dog form. It has been painted on an Athenian jug dating from 400BC. Another is depicted in a painting from the Micenean Age of 150BC. Studies of bones and observations of paintings and sculptures at least 3000 years old conclude that the Spitz of the peat areas lived on, century after century, unchanged by time and from which descended the breed that we know today.